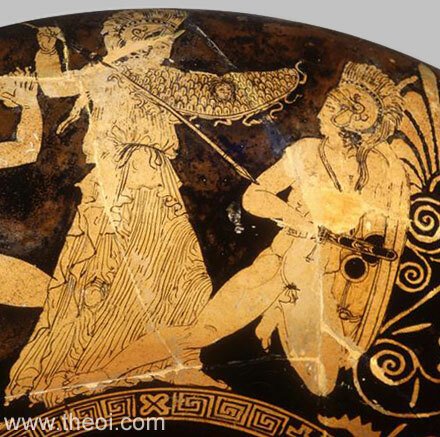 Detail of Athena battling the giant Enceladus from a painting of the Gigantomachia (War of the Giants). Athena battles the giant Enceladus. The goddess wears the serpent-trimmed, Gorgon-headed aegis draped across her arm as a shield and brandishes a spear. The fallen, beardless Gigante is equipped with a shield and crested helm and draws a sword from a scabbard.